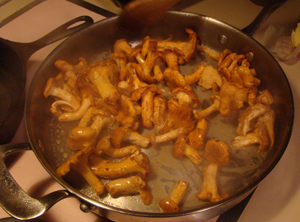 Turns out chanterelles don’t really *have* much of a natural flavor. In fact, I had to drizzle a bit of white truffle oil on them just to make them fun enough to eat! Lesson learned: while the name may sound all French and elegant compared to, say, oyster mushrooms, the latter is actually much tastier. Now I know!